This is a tale that might be told in many ways and from various points of view; it has to be gathered from here and there — a letter, a report, a diary, a casual reference; in its day the thing was more than a passing wonder, and it left a mark of abiding horror on the neighborhood. The house in which Mr. Orford lived has finally been destroyed, the mural tablet in St. Paul’s, Covent Garden, may be sought for in vain by the curious, but little remains of the old piazza where the quiet scholar passed on his daily walks, the very records of what was once so real have become blurred, almost incoherent in their pleadings with things forgotten; but this thing happened to real people, in a real London, not so long ago that the generation had not spoken with those who remembered some of the actors in this terrible drama. It is round the person of Humphrey Orford that this tale turns, as, at the time, all the mystery and horror centered; yet until his personality was brought thus tragically into fame, he had not been an object of much interest to many; he had, perhaps, a mild reputation for eccentricity, but this was founded merely on the fact that he refused to partake of the amusements of his neighbors, and showed a dislike for much company. But this was excused on the ground of his scholarly predilections; he was known to be translating, in a leisurely fashion, as became a gentleman, Ariosto’s great romance into English couplets, and to be writing essays on recondite subjects connected with grammar and language, which were not the less esteemed because they had never been published. His most authentic portrait, taken in 1733 and intended for a frontispiece for the Ariosto when this should come to print, shows a slender man with reddish hair, rather severely clubbed, a brown coat, and a muslin cravat; he looks straight out of the picture, and the face is long, finely shaped, and refined, with eyebrows rather heavier than one would expect from such delicacy of feature. When this picture was painted Mr. Orford was living near Covent Garden, close to the mansion once occupied by the famous Dr. Radcliffe, a straight-fronted, dark house of obvious gentility, with a little architrave portico over the door and a few steps leading up to it; a house with neat windows and a gloomy air, like every other residence in that street and most other streets of the same status in London. And if there was nothing remarkable about Mr. Orford’s dwelling place or person there was nothing, as far as his neighbors knew, remarkable about his history. He came from a good Suffolk family, in which county he was believed to have considerable estates (though it was a known fact that he never visited them), and he had no relations, being the only child of an only child, and his parents dead; his father had purchased this town house in the reign of King William, when the neighborhood was very fashionable, and up to it he had come, twenty years ago — nor had he left it since. He had brought with him an ailing wife, a house-keeper, and a man-servant, and to the few families of his acquaintance near, who waited on him, he explained that he wished to give young Mrs. Orford, who was of a mopish disposition, the diversion of a few months in town. DIED NOVEMBER, 1713, AGED 27 YEARS. Mr. Orford made no effort to leave the house; he remained, people thought, rather stunned by his loss, kept himself close in the house, and for a considerable time wore deep mourning. But this was twenty years ago, and all had forgotten the shadowy figure of the young wife, whom so few had seen and whom no one had known anything about or been interested in, and all trace of her seemed to have passed out of the quiet, regular, and easy life of Mr. Orford, when an event that gave rise to some gossip caused the one-time existence of Flora Orford to be recalled and discussed among the curious. This event was none other than the sudden betrothal of Mr. Orford and the announcement of his almost immediate marriage. The bride was one who had been a prattling child when the groom had first come to London: one old lady who was forever at her window watching the little humors of the street recollected and related how she had seen Flora Orford, alighting from the coach that had brought her from the country, turn to this child, who was gazing from the railing of the neighboring house, and touch her bare curls lovingly and yet with a sad gesture. And that was about the only time anyone ever did see Flora Orford, she so soon became ailing; and the next the inquisitive old lady saw of her was the slender brown coffin being carried through the dusk towards St. Paul’s Church. But that was twenty years ago, and here was the baby grown up into Miss Elisa Minden, a very personable young woman, soon to be the second Mrs. Humphrey Orford. Of course there was nothing very remarkable about the match; Elisa’s father, Dr. Minden, had been Mr. Orford’s best friend (as far as he could be said to have a best friend, or indeed any friend at all) for many a long year, both belonged to the same quiet set, both knew all about each other. Mr. Orford was not much above forty-five or so, an elegant, well-looking man, wealthy, with no vices and a calm, equable temper; while Miss Elisa, though pretty and well-mannered, had an insufficient dowry, no mother to fend for her, and the younger sisters to share her slender advantages. So what could anyone say save that the good doctor had done very well for his daughter, and that Mr. Orford had been fortunate enough to secure such a fresh, capable maiden for his wife? It was said that the scholar intended giving up his bookish ways — that he even spoke of going abroad a while, to Italy, for preference; he was of course, anxious to see Italy, as all his life had been devoted to preparing the translation of an Italian classic. The quiet betrothal was nearing its decorous conclusion when one day Mr. Orford took Miss Minden for a walk and brought her home round the piazza of Covent Garden, then took her across the cobbled street, past the stalls banked up with the first spring flowers (it was the end of March), under the portico built by the great Inigo Jones, and so into the church. “I want to show you where my wife Flora lies buried,” said Mr. Orford. And that is really the beginning of the story. Now, Miss Minden had been in this church every Sunday of her life and many weekdays, and had been used since a child to see that tablet to Flora Orford; but when she heard these words in the quiet voice of her lover and felt him draw her out of the sunlight into the darkness of the church, she experienced a great distaste that was almost fear. It seemed to her both a curious and a disagreeable thing for him to do, and she slipped her arm out of his as she replied. “But first I must show this,” he insisted, and took her arm again and led her down the church, past his seat, until they stood between his pew end and the marble tablet in the wall which was just a hand’s space above their heads. Now, Elisa Minden knew absolutely nothing of her predecessor, and could not tell if these words were spoken in reverence or irony, so she said nothing but looked up rather timidly from under the shade of her Leghorn straw at the tall figure of her lover, who was staring sternly at the square of marble. “And what have you to say to Flora Orford?” he asked sharply, looking down at her quickly. “Why, sir, she was a stranger to me,” replied Miss Minden. Mr. Orford pressed her arm. The words and his manner of saying them filled Miss Minden with shuddering terror, for she was a sensitive and fanciful girl, and it seemed to her a dreadful thing to be thus standing over the bones of the poor creature who had loved the man who was now to be her husband, and horrible to think that the handful of decay so near them had once clung to this man and loved him. The girl could not reply as to that; this sudden disclosing of a painful secret abashed her simple mind. Miss Minden did not respond; hitherto she had been fond of the church, now it seemed spoilt for her — tarnished by the thought of Flora Orford. Her companion seemed to divine what reflection lay behind her silence. And he reached out the light cane he wore and tapped on the stone above his wife’s grave, and slowly smiled as the sound rang hollow in the vaults beneath. Then he allowed Elisa to draw him away, and they returned to Mr. Orford’s comfortable house, where in the upper parlor Dr. Minden was awaiting them together with his sister and her son, a soldier cousin whom the quick perceptions of youthful friends had believed to be devoted to Elisa Minden. They made a pleasant little party with the red curtains drawn, and the fire burning up between the polished andirons and all the service for tea laid out with scones and Naples cake, and Mrs. Boyd coming to and fro with plates and dishes. And everyone was cheerful and friendly and glad to be indoors together, with a snowstorm coming up and people hurrying home with heads bent before a cutting wind. And she wondered in which room, and also why this had never occurred to her before, and glanced rather thoughtfully at the fresh young face of the soldier cousin as he stood by the fire in his scarlet and white, with his glance on the flames. But it was a cheerful party, and Elisa smiled and jested with the rest as she reserved the dishes at tea. There is a miniature of her painted about this time, and one may see how she looked with her bright brown hair and bright brown eyes, rosy complexion, pretty nose and mouth, and her best gown of lavender blue tabinet with a lawn tucker and a lawn cap fastened under the chin with frilled lappets, showing now the big Leghorn hat with the velvet strings was put aside. Mr. Orford also looked well tonight; he did not look his full age in the ruddy candle glow, the grey did not show in his abundant hair nor the lines in his fine face, but the elegance of his figure, the grace of his bearing, the richness of his simple clothes, were displayed to full advantage; Captain Hoare looked stiff and almost clumsy by contrast. But now and then Elisa Minden’s eyes would rest rather wistfully on the fresh face of this young man who had no dead wife in his life. And something was roused in her meek youth and passive innocence, and she wondered why she had so quietly accepted her father’s arrangement of a marriage with this elderly scholar, and why Philip Hoare had let her do it. Her thoughts were quite vague and amounted to no more than a confused sense that something was wrong, but she lost her satisfaction in the tea-drinking and the pleasant company, and the warm room with the drawn curtains, and the bright fire, and rose up saying they must be returning, as there was a great store of mending she had promised to help her aunt with; but Mrs. Hoare would not help her out, but protested, laughing, that there was time enough for that, and the good doctor, who was in a fine humor and in no mood to go out into the bleak streets even as far as his own door, declared that now was the time they must be shown over the house. The soldier spoke, not so pleasantly as his uncle. “What have you so mysterious, sir, in this same cabinet, that it must be so jealously guarded?” he asked. “You will show them to me?” asked Elisa Minden, and her lover gave graceful consent; there was further amiable talk, and then the whole party, guided by Mr. Orford holding a candle, made a tour of the house and looked over the fine rooms. Mrs. Hoare took occasion to whisper to the bride-to-be that there were many alterations needed before the place was ready for a lady’s use, and that it was time these were put in hand — why, the wedding was less than a fortnight off! And Elisa Minden, who had not had a mother to advise her in these matters, suddenly felt that the house was dreary and old-fashioned, and an impossible place to live in; the very rooms that had so pleased her good father — a set of apartments for a lady — were to her the most hateful in the house, for they, her lover told her, had been furnished and prepared for Flora Orford, twenty years ago. She was telling herself that when she was married she must at once go away and that the house must be altered before she could return to it, when the party came crowding to the threshold of the library or private cabinet, and Mr. Orford, holding the candle aloft, led them in. Then as this illumination was not sufficient, he went very quickly and lit the two candles on the mantelpiece. It was a pleasant apartment, lined with books from floor to ceiling, old, valuable, and richly bound books, save only in the space above the chimney piece, which was occupied by a portrait of a lady and the panel behind the desk; this was situated in a strange position, in the farthest corner of the room fronting the wall, so that anyone seated there would be facing the door with the space of the room between; the desk was quite close to the wall, so that there was only just space for the chair at which the writer would sit, and to accommodate this there were no bookshelves behind it, but a smooth panel of wood on which hung a small picture; this was a rough, dark painting, and represented a man hanging on a gallows on a wild heath; it was a subject out of keeping with the luxurious room with its air of ease and learning, and while Mr. Orford was showing his first editions, his Elzevirs and Aldines, Elisa Minden was staring at this ugly little picture. As she looked she was conscious of such a chill of horror and dismay as nearly caused her to shriek aloud. The room seemed to her to be full of an atmosphere of terror and evil beyond expression. Never had such a thing happened to her before; her visit to the tomb in the afternoon had been as nothing to this. She moved away, barely able to disguise an open panic. As she turned, she half-stumbled against a chair, caught at it, and noticed, hanging over the back, a skirt of peach-colored silk. Elisa, not being mistress of herself, caught at this garment. All turned to look at her; her tone, her obvious fright, were out of proportion to her discovery. “A gift for you, my dear,” said the cheerful doctor. And she held up the skirt, which had indeed become like tinder and seemed ready to drop to pieces. Now, two things about this speech made a strange impression on everyone; first, it was manifestly impossible that the good housekeeper would ever have owned such a garment as this, that was a lady’s dress and such as would be worn for a ball; secondly, Mr. Orford had only a short while before declared that Mrs. Boyd only entered his room when he was in it, and then of a necessity and for a few minutes. All had the same impression, that this was some garment belonging to his dead wife and as such cherished by him; all, that is, but Elisa, who had heard him call Flora Orford a wicked woman. She put the silk down quickly (there was a needle sticking into it and a spool of cotton lying on the chair beneath) and looked up at the portrait above the mantelpiece. “Is that Mrs. Orford?” she asked. He gave her a queer look. In a strange silence all glanced up at the picture. It showed a young woman in a white gown, holding a crystal heart that hung round her neck; she had dark hair and a pretty face; as Elisa looked at the pointed fingers holding the pretty toy, she thought of the tablet in St. Paul’s Church and Mr. Orford’s words —“She is so near to you that if she could stretch out her hand she could touch you,” and without any remark about the portrait or the sitter, she advised her aunt that it was time to go home. So the four of them left, and Mr. Orford saw them out, standing framed in the warm light of the corridor and watching them disappear into the grey darkness of the street. It was a little more than an hour afterwards when Elisa Minden came creeping down the stairway of her home and accosted her cousin, who was just leaving the house. The young soldier looked at her keenly as she stood in the light of the hall lamp, and he saw that she was very agitated. “Of course, Lizzie,” he answered kindly, and led her into the little parlor off the hall where there was neither candles or fire, but leisure and quiet to talk. Elisa, being a housekeeper, found a lamp and lit it, and apologized for the cold, but she would not return upstairs, she said, for Mrs. Hoare and the two girls and the doctor were all quiet in the great parlor, and she had no mind to disturb them. “You are in trouble,” said Captain Hoare quietly. She had no very good explanation; there was only the visit to the church that afternoon, her impression of horror in the cabinet, the discovery of the scoured silk. Miss Minden stared at her cousin; she did not know why she had done it; the whole thing seemed suddenly impossible. “Please, you must come with me now,” she said. So overwrought was she that he had no heart to refuse her, and they took their warm cloaks from the hall and went out into the dark streets. It was snowing now and the ground slippery under foot, and Elisa clung to her cousin’s arm. She did not want to see Mr. Orford or his house ever again, and by the time they reached the doorstep she was in a tremble; but she rang the bell boldly. It was Mrs. Boyd herself who came to the door; she began explaining that the master was shut up in his cabinet, but the soldier cut her short. So Elisa followed the housekeeper down to her basement sitting-room; the man-servant was out, and the two maids were quickly dismissed to the kitchen. Mrs. Boyd, a placid soul, near seventy-years, waited for the young lady to explain herself, and Elisa Minden, flushing and paling by turns, and feeling foolish and timid, put forth the object of her coming. She wanted to hear the story of Flora Orford — there was no one else whom she could ask — and she thought that she had a right to know. “Not his wife yet.” said Miss Minden. “Tell it me and then I will forget,” begged Miss Minden. So then Mrs. Boyd, who was a quiet, harmless soul with no dislike to telling a tale (though no gossip, as events had proved, she having kept her tongue still on this matter for so long), told her story of Humphrey Orford’s wife; it was told in very few words. And this was the story of Flora Orford. “And the man?” asked Miss Minden, after a little. “What was his end?” asked Miss Minden in a still voice. Elisa Minden clapped her hand to her heart. “Do not tell me these things or I shall think that you are hateful too, to have stayed in this dreadful house and endured them!” Mrs. Boyd was surprised. “Now, my dear, do not be put out,” she protested. But Elisa Minden had risen and had her fingers on the handle of the door. But Miss Minden had run upstairs to the cold hall. Her cousin was not there; she heard angry voices overhead and saw the two maid-servants affrighted on the stairs; a disturbance was unknown in this household. While Elisa stood bewildered, a door banged, and Captain Hoare came down red in the face and fuming; he caught his cousin’s arm and hurried her out of the house. In an angry voice he told her of the unwarrantable behavior of Mr. Orford, who had found him in the hall and called him “intruder” and “spy” without waiting for an explanation; the soldier had followed the scholar up to his cabinet and there had been an angry scene about nothing at all, as Captain Hoare said. And she told him the story of Flora Orford. The young man pressed her arm through the heavy cloak. They spoke no more, but Elisa, happy in the protecting and wholesome presence of her kinsman, sobbed with a sense of relief and gratitude. When they reached home they found they had been missed and there had to be explanations; Elisa said there was something that she had wished to say to Mrs. Boyd, and Philip told of Mr. Orford’s rudeness and the quarrel that had followed. The two elder people were disturbed and considered Elisa’s behavior strange, but her manifest agitation caused them to forbear pressing her for an explanation; nor was it any use addressing themselves to Philip, for he went out to his delayed meeting with companions at a coffee-house. That night Elisa Minden went to bed feeling more emotion than she had ever done in her life; fear and disgust of the man whom hitherto she had placidly regarded as her future husband, and a yearning for the kindly presence of her childhood’s companion united in the resolute words she whispered into her pillow during that bitter night. The next day it snowed heavily, yet a strange elation was in Elisa’s heart as she descended to the warm parlor, bright from the fire and light from the glow of the snow without. She was going to tell her father that she could not carry out her engagement with Mr. Orford, and that she did not want ever to go into his house again. They were all gathered round the breakfast-table when Captain Hoare came in late (he had been out to get a newsletter) and brought the news that was the most unlooked for they could conceive, and that was soon to startle all London. Mr. Orford had been found murdered in his cabinet. These tidings, though broken as carefully as possible, threw the little household into the deepest consternation and agitation; there were shrieks, and cryings, and running to and fro. Only Miss Minden, though of a ghastly color, made no especial display of grief; she was thinking of Flora Orford. When the doctor could get away from his agitated womenkind, he went with his nephew to the house of Mr. Orford. The story of the murder was a mystery. The scholar had been found in his chair in front of his desk with one of his own bread-knives sticking through his shoulders; and there was nothing to throw any light as to how or through whom he had met his death. At half-past nine the night before, Mrs. Boyd had sent one of the maids up with her master’s supper; it was his whim to have it always thus, served on a tray in the cabinet. There had been wine and meat, bread and cheese, fruit and cakes — the usual plates and silver — among these the knife that had killed Mr. Orford. When the servant left, the scholar had followed her to the door and locked it after her; this was also a common practice of his, a precaution against any possible interruption, for, he said, he did the best part of his work in the evening. It was found next morning that his bed had not been slept in, and that the library door was still locked; as the alarmed Mrs. Boyd could get no answer to her knocks, the man-servant had sent for someone to force the lock, and Humphrey Orford had been found in his chair, leaning forward over his papers with the knife thrust up to the hilt between his shoulders; he must have died instantly, for there was no sign of any struggle, nor any disarrangement of his person or his papers. The first doctor to see him, a passer-by, attracted by the commotion about the house, said he must have been dead some hours — probably since the night before; the candles had all burnt down to the socket, and there were spillings of grease on the desk; the supper tray stood at the other end of the room, most of the food had been eaten, most of the wine drunk, the articles were all there in order excepting only the knife sticking between Mr. Orford’s shoulder-blades. When Captain Hoare had passed the house on his return from buying the newsletter he had seen the crowd and gone in and been able to say that he had been the last person to see the murdered man alive, as he had had his sharp encounter with Mr. Orford about ten o’clock, and he remembered seeing the supper things in the room. The scholar had heard him below, unlocked the door, and called out such impatient resentment of his presence that Philip had come angrily up the stairs and followed him into the cabinet; a few angry words had passed, when Mr. Orford had practically pushed his visitor out, locking the door in his face and bidding him take Miss Minden home. This threw no light at all on the murder; it only went to prove that at ten o’clock Mr. Orford had been alive in his cabinet. Now here was the mystery; in the morning the door was still locked, on the inside, the window was, as it had been since early evening, shuttered and fastened across with an iron bar, on the inside, and, the room being on an upper floor, access would have been in any case almost impossible by the window which gave on to the smooth brickwork of the front of the house. Neither was there any possible place in the room where anyone might be hidden — it was just the square lined with the shallow bookshelves, the two pictures (that sombre little one looking strange now above the bent back of the dead man), the desk, one or two chairs and side tables; there was not so much as a cupboard or bureau — not a hiding-place for a cat. How, then, had the murderer entered and left the room? Suicide, of course, was out of the question, owing to the nature of the wound — but murder seemed equally out of the question; Mr. Orford sat so close to the wall that the handle of the knife touched the panel behind him. For anyone to have stood between him and the wall would have been impossible; behind the back of his chair was not space enough to push a walking-stick. How, then, had the blow been delivered with such deadly precision and force? Not by anyone standing in front of Mr. Orford, first because he must have seen him and sprung up; and secondly, because, even had he been asleep with his head down, no one, not even a very tall man, could have leaned over the top of the desk and driven in the knife, for experiment was made, and it was found that no arm could possibly reach such a distance. The only theory that remained was that Mr. Orford had been murdered in some other part of the room and afterwards dragged to his present position. But this seemed more than unlikely, as it would have meant moving the desk, a heavy piece of furniture that did not look as if it had been touched, and also became there was a paper under the dead man’s hand, a pen in his fingers, a splutter of ink where it had fallen, and a sentence unfinished. The thing remained a complete and horrid mystery, one that seized the imagination of men; the thing was the talk of all the coffee-houses and clubs. The murder seemed absolutely motiveless, the dead man was not known to have an enemy in the world, yet robbery was out of the question, for nothing had been even touched. The early tragedy was opened out. Mrs. Boyd told all she knew, which was just what she had told Elisa Minden — the affair was twenty years ago, and the gallows bird had no kith or kin left. Elisa Minden fell into a desperate state of agitation, a swift change from her first stricken calm; she wanted Mr. Orford’s house pulled down — the library and all its contents burnt; her own wedding-dress did she burn, in frenzied silence, and none dare stop her; she resisted her father’s entreaties that she should go away directly after the inquest; she would stay on the spot, she said, until the mystery was solved. Nothing would content her but a visit to Mr. Orford’s cabinet; she was resolved, she said wildly, to come to the bottom of this mystery and in that room, which she had entered once and which had affected her so terribly, she believed she might find some clue. The doctor thought it best to allow her to go; he and her cousin escorted her to the house that now no one passed without a shudder and into the chamber that all dreaded to enter. Good Mrs. Boyd was sobbing behind them; the poor soul was quite mated with this sudden and ghastly ending to her orderly life; she spoke all incoherently, explaining, excusing, and lamenting in a breath; yet through all her trouble she showed plainly and artlessly that she had had no affection for her master, and that it was custom and habit that had been wounded, not love. Indeed, it seemed that there was no one who did love Humphrey Orford; the lawyers were already busy looking for a next-of-kin; it seemed likely that this property and the estates in Suffolk would go into Chancery. 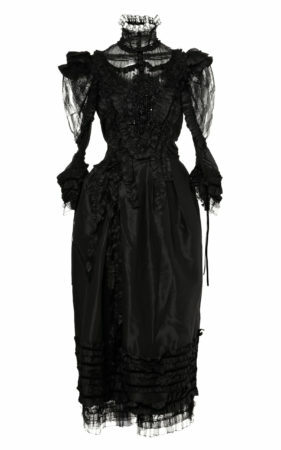 “You should not go in, my dear, you should not go in,” sobbed the old woman, catching at Miss Minden’s black gown (she was in mourning for the murdered man) and yet peering with a fearful curiosity into the cabinet. Elisa looked ill and distraught but also resolute. The startled housekeeper protested that she had never seen it again; and here was another touch of mystery — the old peach-colored silk skirt that four persons had observed in Mr. Orford’s cabinet the night of his murder, had completely disappeared. “He must have burnt it,” said Captain Hoare, and though it seemed unlikely that he could have consumed so many yards of stuff without leaving traces in the grate, still it was the only possible solution. “A ghastly relic,” remarked the young soldier grimly. Elisa Minden went into the middle of the room and stared about her; nothing in the place was changed, nothing disordered; the desk had been moved round to allow of the scholar being carried away, his chair stood back, so that the long panel on which hung the picture of the gallows, was fuller exposed to view. To Elisa’s agitated imagination this portion of the wall sunk in the surrounding bookshelves, long and narrow, looked like the lid of a coffin. And she turned about and stared at the portrait of Flora Orford. She looked round at her father and cousin, and her face quite distorted. They hastened towards her, thinking that her over-strained nerves had given way; but she took a step forward. Shriek after shriek left her lips. With a quivering finger she pointed before her at the long panel behind the desk. At first they could not tell at what she pointed; then Captain Hoare saw the cause of her desperate terror. It was a small portion of faded, peach-colored silk showing above the ribbed line of the wainscot, protruding from the wall, like a garment of stuff shut in a door. A certain frenzy fell on all of them; they were in a confusion, hardly knowing what they said or did. Only Captain Hoare kept some presence of mind and, going up to the panel, discerned a fine crack all round. He lifted the picture of the hanged man and found a small knob or button, which, as he expected, on being pressed sent the panel back into the wall, disclosing a secret chamber no larger than a cupboard. And directly inside this hidden room that was dark to the sight and noisome to the nostrils, was the body of a woman, leaning against the inner wall with a white kerchief knotted tightly round her throat, showing how she had died; she wore the scoured silk skirt, the end of which had been shut in the panel, and an old ragged bodice of linen that was like a dirty parchment; her hair was grey and scanty, her face past any likeness to humanity, her body thin and dry. The room, which was lit only by a window a few inches square looking onto the garden, was furnished with a filthy bed of rags and a stool with a few tattered clothes; a basket of broken bits was on the floor. “It is Flora Orford,” she said, speaking like one in a dream. They brought the poor body down into the room, and then it was clear that this faded and terrible creature had a likeness to the pictured girl who smiled from the canvas over the mantelpiece. And another thing was clear and, for a moment, they did not dare speak to each other. For twenty years this woman had endured her punishment in the wall chamber in that library that no one but her husband entered; for twenty years he had kept her there, behind the picture of her lover, feeding her on scraps, letting her out only when the household was abed, amusing himself with her torture — she mending the scoured silk she had worn for twenty years, sitting there, cramped in the almost complete dark, a few feet from where he wrote his elegant poetry. The coffin bearing the nameplate “Flora Orford” was exhumed, and found to contain only lead; it was substituted by another containing the wasted body of a woman who died by her own hand twenty years after the date on the mural tablet to her memory. Why or how this creature, certainly become idiotic and dominated entirely by the man who kept her prisoner, had suddenly found the resolution and skill to slay her tyrant and afterwards take her own life (a thing she might have done any time before) was a question never solved. It was supposed that he had formed the hideous scheme to complete his revenge by leaving her in the wall to die of starvation while he left with his new bride for abroad, and that she knew this and had forestalled him; or else that her poor, lunatic brain had been roused by the sound of a woman’s voice as she handled the scoured silk which the captive was allowed to creep out and mend when the library door was locked. But over these matters and the details of her twenty years’ suffering, it is but decent to be silent. Lizzie Minden married her cousin, but not at St. Paul’s, Covent Garden. Nor did they ever return to the neighborhood of Humphrey Orford’s house. I’ll never forget the reason poor, mad Flora Orford did not cry out – ‘He saw to that – she has got no tongue’. Try ‘The case of Lady Sannox’ by Conan Doyle – it’s still shocking. Conan Doyle wrote some properly unpleasant horror stories. ‘Lady Sannox’ is very, very nasty indeed, especially the last few lines. Another really unpleasant story about a wronged husband is by another writer whose trips into horror are rare, but worth reading – you might enjoy ‘The Cone’ by H.G. Wells. A beautiful piece of writing, with a dark, and really, really horrid ending. Thank you,Chris,for posting that story. I had to get up early this morning to finish reading it. It was worth it and I could see the similarity to Conan Doyle’s story of Lady Sannox. I read ‘The Case of Lady Sannox ‘ after Admin mentioned it in a post a few years ago, and it’s a bona fide flesh crawler of the first order. I will try to track down a copy of The Cone. Wells wrote some truly nasty stories – ‘Pollock and the Porroh Man’ sticks in my mind, probably from one of Herbert Van Thal’s Pan anthologies.. Shades of Wilkie Collins, A.C. Doyle, Anna Katherine Green, and our ongoing meme of women shut up/locked away– physically/mentally. Is this something we secretly wish for/enjoy? I prefer stories where the woman decides to dig the grave.